The Kishu Ken is one of six native Japanese dogs that in Japan are classified by size because they are so similar in type. The Akita Inu is the only large breed and the Shiba Inu the small. The last four are medium, Kai Ken, Hokkaido Inu, Kishu Ken, and Shikoku Inu. The Kishu Ken is named for the mountainous area of Kishu, Ken simply translates to ‘dog’. Originally a hunting breed, the Kishu Ken was used mainly with deer, boar, and smaller game such as rabbits. Renowned for its bravery, it was said they would rush an enraged animal in order to protect the hunter and give them time to reload. There are three strains of working Kishu Ken, depending on the prey they are trained to hunt. Wild boar dogs are more muscular with a fiercer temperament, deer dogs are more slender and agile, while rabbit dogs are slightly smaller. The Kishu Ken has existed in Japan for thousands of years. They were developed on the Kii Peninsula, which contains the Mie, Wakayama, and Nara Prefectures. Once there were several strains of Kishu throughout the region, giving them names such as Kumano Inu, Taiji Inu, and Ouchiyama Inu. Their modern name would not be adopted until they were recognized as a Natural Monument in 1934. 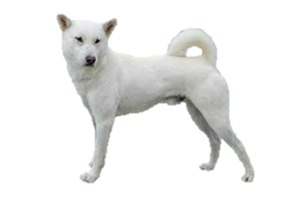 Today the Kishu Ken is the most common of the medium Japanese breeds, but it is still rare, particularly outside Japan. Is the Kishu Ken Right for You?